A sweet 16 birthday cake needs to be as sweet and sassy as the birthday girl. 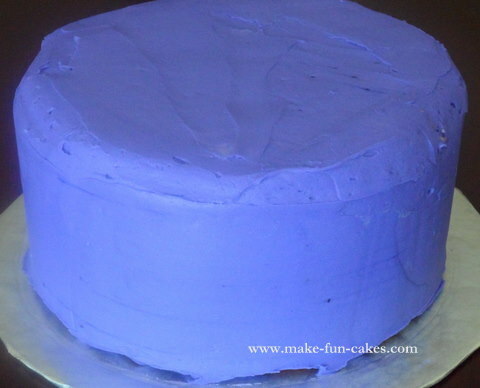 Here is a great example of an easy birthday cake that looked and tasted great. My little sister was turning the big 16 and she requested a vanilla cake with raspberry mousse filling and cream cheese icing. She wanted the colors to be purple and black. I decided to make a simple cake with fondant decorations. The stripes, roses and sweet 16 cake topper were all made from fondant. About a week before the cake is needed, make the fondant roses and the fondant 16. Make 32 small fondant roses. Allow both to harden. 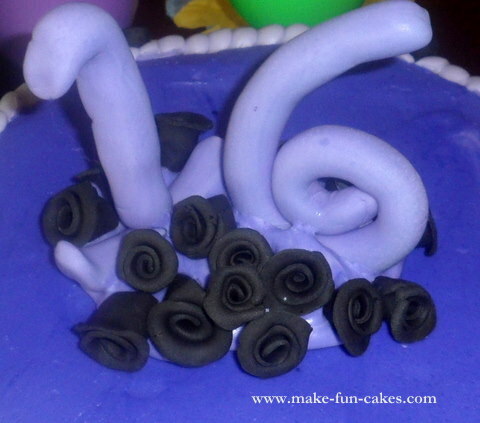 The number 16 and the roses will be the sweet 16 birthday cake topper. Cover a 10-inch round cake board with Fanci-Foil or Fondant. Bake the cake according to recipe directions. Remember to generously grease and flour or spray with baking spray. Cool the cake 15 minutes in the pan after it is finished baking and then remove from the pans. Allow to cool completely. Fill and frost the cooled cake. Next measure the height of the cake. This is how tall you want your stripes to be. Decide on the width. I varied the width on mine. I made some 1/2 inch and some 1/4 inch. Using the 8-inch round parchment paper, decide what pattern you want to place your stripes. 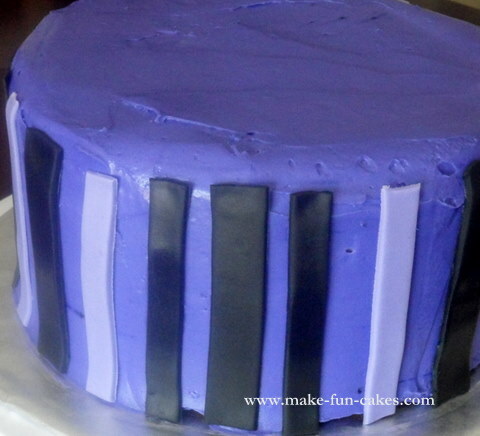 My pattern was 1/4-inch purple, 1/2-inch black, 1/4-inch purple, 1/4-inch black, 1/2-inch black, 1/4-inch black, repeated around the cake. It is much easier to visualize this with a picture. When you have marked the parchment paper, lay it on top of the cake and mark the cake with a spatula. 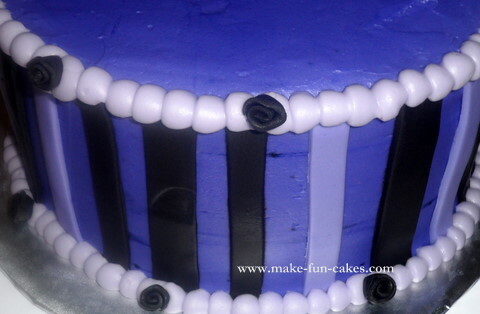 Place the fondant stripes on the cake. The sweet 16 cake topper is next. Pipe a mound of icing in the center of the cake. Place the 16 in the center. You may need to hold the numbers in place while the icing hardens somewhat to ensure the numbers will not fall over. Situate 16 of the small roses attractively around the 16. 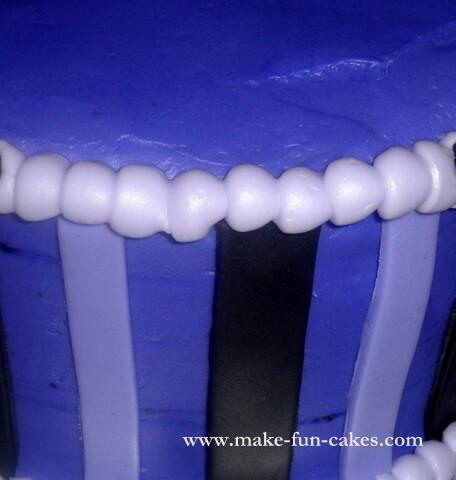 Next, use a Wilton round #10 tip to pipe your border on the top and bottom of the cake. Arrange the fondant roses on the border. I placed 8 roses on the top border and 8 roses on the bottom border, staggering them so the roses on the top and bottom were not lined up. 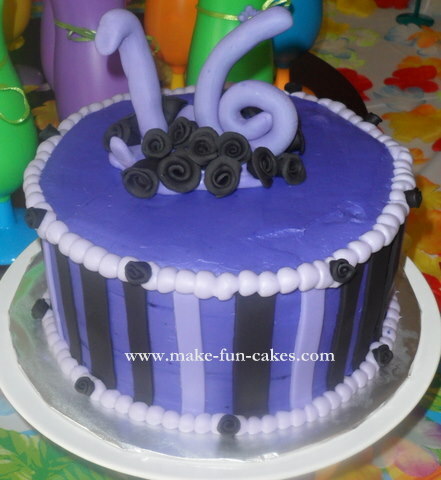 With a little patience and a lot of love, your sweet 16 cake is complete. My sister loved her cake and it looked great with the beach party decorations. Not quite the cake you were after? Check out our other girl birthday cake ideas. 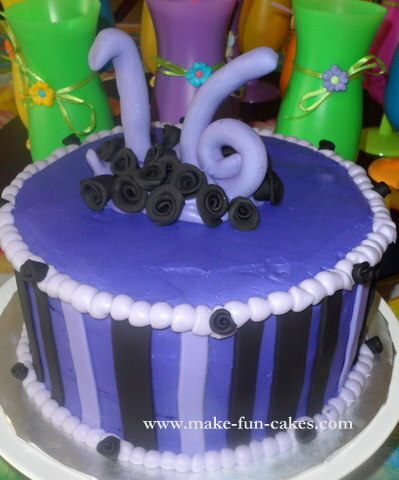 Any birthday cake design you find here can be adapted for a 16th birthday cake.